﻿Bruce Goodman's "Jemima hatches a plot"
Jemima Puddle-duck was employed as a secret agent. And she worked hard for it. For nine days running she had to lay an egg in the fox’s shed of feathers. Next she had to bring a load of herbs: sage and thyme, and mint and two onions, and some parsley. Every day she had to report progress to Kep, the collie-dog. In the end, Kep and a couple of fox-hound puppies got the fox good and proper. Trouble was, Jemima didn’t get paid, and the fox-hounds ate her eggs. 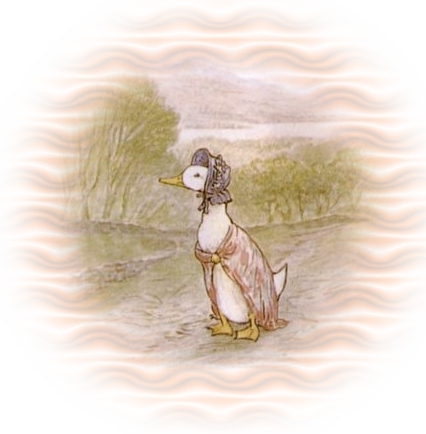 “The lot of you can go jump in the lake,” huffed Jemima. “I wanted babies in this story, and I’m not getting them. There’s plenty of other fish to fry.” With that, she waddled off to become the duck in another book. It’s because of this mess-up that she hatched out The Ugly Duckling.